Statistically, Recurrent Herniated Nucleus Pulposus occur more commonly than hoped. When you have a Herniated Nucleus Pulposus, the outer fibers of your disk, or the annulus has weakened allowing a tear, and subsequent rupture of the soft nucleus material out of the disk. We can debate the cause of the weakening of the outer annulus, but usually, it is a combination of wear on the crosslinking fibers for the outer fibro cartilage, combined with forces placed within the disk causing the softer inside (nucleus) to rupture, or herniate outside the fibers of the annulus. More recent studies demonstrate that disruption of the endplate of the disk may also be the cause of herniations. In most instances, even with a large disk herniation, the pain can subside without surgery. The nucleus material that ruptured tends to dessicate, or dehydrate causing less pressure on the nerve elements over time. Also, the initial release of potentially pain generating materials from the disk gets absorbed, also lessening the pain. But, the disk, unfortunately, is now changed. While the torn fibers of the annulus tries to repair itself, the scar formation sealing the tear is never as strong as the original annulus. It becomes a potential weak spot, and there is a concern for recurrent disk herniations through that same area of tear and scaring. This Recurrent Herniated Nucleus Pulposus rate remains similar for both surgically treated, or non surgically treated disks, as the scarring of the annulus remains the same. Some of the so called surgical failures are actually patients that suffered from a Recurrent Herniated Nucleus Pulposus, and not necessarily because of failure of technique. Recently, there has been some effort on annulus repair , with sutures. While there is some promise, the long term data is still not clear. 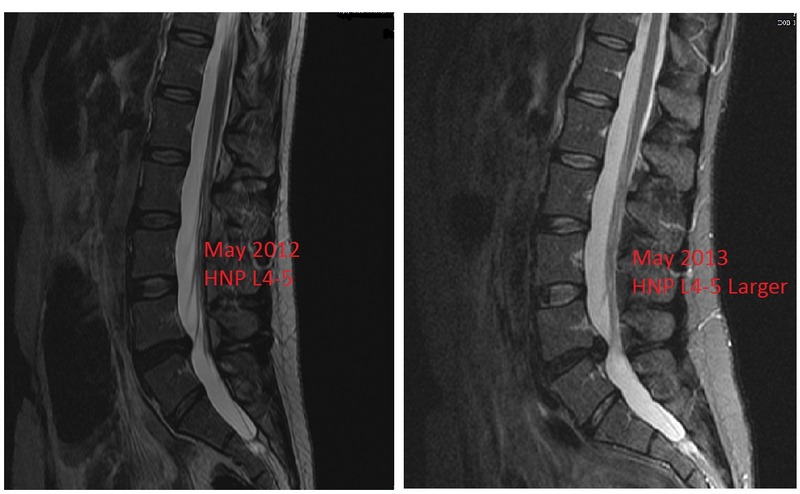 Recurrent Herniated Nucleus Pulposus can be treated similar to the initial disk herniation. Activities modification, use of medications, physical therapy and steroid injections are common treatments prescribed. If there is no improvement, surgery can also be an option. In the circumstance of Recurrent Herniated Nucleus Pulposus in a patient who had prior surgery at the same level, sometimes a more aggressive surgical option, which includes removal of most of the disk and fusion may be recommended. There are other stabilization procedures other than fusion, but many of the insurance entities consider these procedures experimental. If you suspect you have a Recurrent Herniated Nucleus Pulposus, please contact your physician to see what can be done to decrease your symptoms. Play atlethic games after treatment?? Thank you for the answer. Hi! Often a recurrent disc needs reoperation if the patient is symptomatic and does not improve after several weeks. We do not recommend any sports while waiting for an improvement. If the patient improves, it will take several months for the annulus (the hard outer covering of the disc) to heal so more disc does not herniate. For both surgery, and waiting for the annulus to heal, 3 months without strenuous activity are ideal.